Although viewer engagement has always been an important TV metric, it’s especially critical in this increasingly competitive landscape. With social media and live-streaming, viewers now expect to participate in the stories they’re consuming. The newest evolution in this live-viewer engagement is the ability to text hosts on-air. 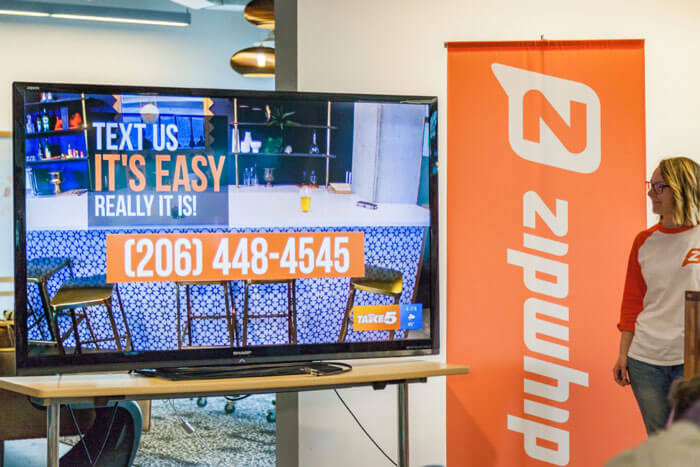 First adopted by TAKE 5, the newest show from KING 5 TV’s, Zipwhip’s technology allows viewers to text in live while the show is happening. It keeps viewers engaged and boosts the positive feelings of involvement. Even more recently, TV shows introduced social media to drive this same type of engagement. Stations acknowledged that viewers no longer use one screen at a time. Instead of competing with mobile devices, they embraced the medium. Think about the presidential debates. Twitter usage spiked during this live broadcast with everyone across the globe chiming in and participating in the discussion. For better or for worse, social media has allowed massive amounts of people to virtually communicate in real-time. But with this, comes problems. In these cases, short-code texting or phone calls to automated numbers are used to track viewer votes. Those technologies lack the capacity for two-way conversation, therefore limiting the amount of engagement. Concerns about social media data security breaches (such as Facebook’s privacy battle) have caused flocks of users to abandon beloved platforms. The increased negativity and scrutiny that comes with publicly posting opinions online deters many from participating in the conversation. Social Media vs. Texting – Which One Drives More Engagement? Although not yet widely adopted yet, texting allows viewers to do a few things social media doesn’t. These are the reasons that texting is the new wave of live viewer engagement. For example, if a station asks viewers to Tweet in responses, the viewer must have a public Twitter handle and their responses will be visible to everyone viewing their feed. It also ostracizes any viewers who don’t have a Twitter account or access to the Internet. Finally, it’s so many less steps for someone to just send a text than to open up the Twitter app, compose a Tweet, mention the right handle, use the correct hashtag and then send it. Take 5 is a great example of a show using texting in a particularly innovative way. Their revolutionary show encourages viewers to text in questions and comments while the show airs live. They’ll read the comments and answer questions live on-air. This is also a terrific strategy for radio show engagement and live streamer interaction. How does your station engage viewers? How would you like to interact with your favorite live shows?